Update: Urging Egypt's interim government to respect the rights of pro-Morsi demonstrators, the United States said in a statement Monday, "The United States strongly condemns the bloodshed and violence" in Cairo and Alexandria. Not exactly a bold statement. The White House continues to refrain from recognizing Morsi's overthrow as a coup, which would require freezing $1.3 billion of annual military aid. 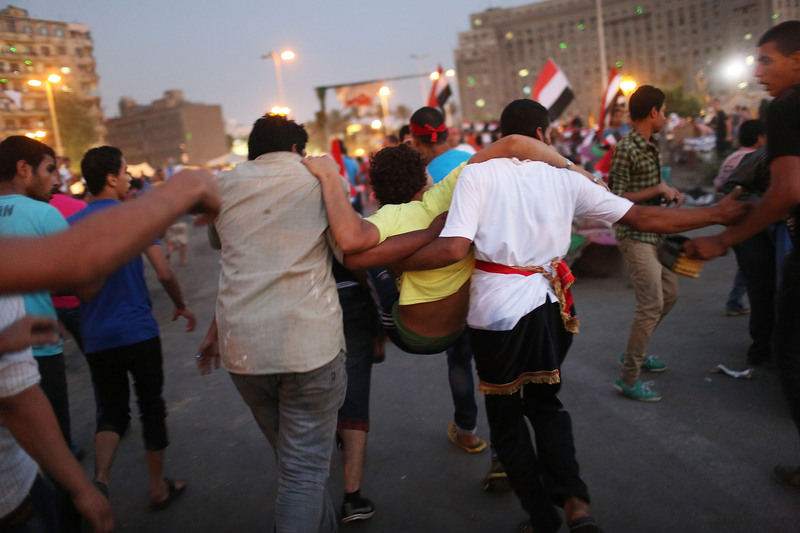 Supporters of overthrown Egyptian President Mohamed Morsi vowed to keep protesting in the country's capital Monday, even after dozens were killed and thousands were injured by Egyptian security services. Leaders and members of the Muslim Brotherhood have been protesting since the beginning of the popular revolt that led to Morsi's ousting by the army last month. Morsi supporters feel severely betrayed by the method of Morsi's removal, and ,any held signs that read, "This is Coup, Not a Revolution." As one of the country's main political parties, Muslim Brotherhood supporters are say they are being shut out of the transitional process. An interim president has been chosen, and the constitution is being reformulated — but the Muslim Brotherhood has been kept out of these proceedings. "[Army General Abdul-Fattah al-Sisi] belongs in a gang," said Dr. Wafaa Hefny, a member of the Muslim Brotherhood’s political wing said of Egypt's top commander. "They are stealing Egypt and selling it to the Israelis and Americans." Secretary of State John Kerry said in a statement Saturday that the violence signified "a pivotal moment for Egypt," adding, “In this extremely volatile environment, Egyptian authorities have a moral and legal obligation to respect the right of peaceful assembly and freedom of expression." Senator Diane Feinstein (D-CA) who heads the Senate Intelligence Committee, took a slightly different stance. Feinstein said Congress should consider suspending $1.5 billion in annual aid to Egypt. "We have to relook at granting aid," she said to CNN. "The ball is in Egypt's court."